Here's another little trick, and one more lighting technique example before we move on to your learning how to "reverse engineer" others' light. And to get you started thinking that way, I am going to guide you through reverse engineering this photo. For lack of a better term, I am going to call this technique "long-throw hard light." This photo, like the backlit kids taking a bow onstage, is a good example of just what kind of a working distance you can acheive with a small shoe-mount flash. The light in this case was a Nikon SB-28 on a stand, at full power, 85mm throw, about a 80-100 feet from the budding gymnasts. I was working at ASA 800 but the light makes the photo crisp and gives the illusion of a lower ASA, in my opinion at least. This was also shot with an early Nikon D1, which did not do nearly as well with high ASA's as do today's bodies. OK, let's break down the light as we explain the technique. Look at the picture. Was the light on the right or the left? It was to my left, as the shadow of the obscurred, back center gymnast on the right side of the background should show you. Was the light hard or soft? Well, you already know that. Hard. As it darn well had better be if you are throwing a shoe-mount flash 100 feet. Imagine how tiny that actual light source looks at that distance. That's how hard the light will appear to the subject. What was my lighting ratio? The tonal value of the shadows of the gymnasts on the wall, compared to the lit portion of the wall, should clue you into the fact that I was working my ambient about 1 1/2 stops below the strobe. "So, gyms are not daylight-lit," you say. No, they are not. Not where I live, anyway. They are usually icky sodium vapor color. The closest I could get my flash was to gel for florescents on the flash, dial it in on the camera, and dial the white balance compensation down to -1 (a bit warmer) to try to "spackle over" the inconsistencies a bit. If I had missed it badly, where would you see it? If you said the color of the (ambient-lit) shadows on the walls, brownie points for you. 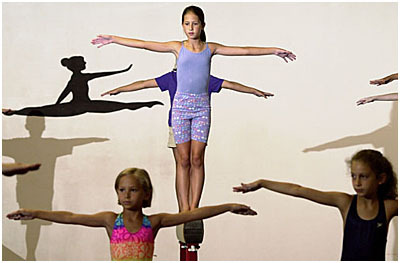 But the gymnasts would have looked a little bit hinky on the shadow side, too. What about the gymnasts in the foreground? They are closer to the flash, yet they are not as brightly lit. What gives? Here's where the tight beam spread of the 85mm setting on the SB-28 pays off for a second time. Because it has a controlled beam spread, I was able to "feather" the light, or aim it a few degrees high. This put the kids on the balance beam in the main path of the light and the kids in front in the fall-off, bottom portion of the beam. Why did I do it? Purely sobjective choice. I wanted to emphasize the kids on the beam, instead of the ones in the foreground. They would have been brighter than the beam kids had I not feathered. The success of this photo is not the final product (I like it, but it is not the end all) but rather the difference in what the photo would have looked like - really bad - if I had shot available light in the dark, cavernous gym. No on-camera lighting technique could have helped much, either.